My Nutri Ninja has been a massive hit. 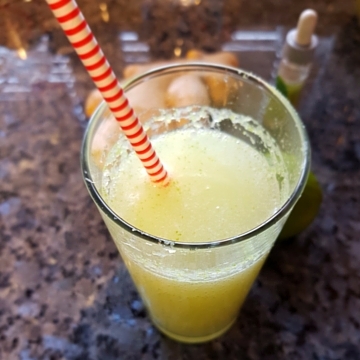 Not only do I make breakfast smoothies which help massively with my hatred of weekday mornings, but I have perfected a few juices and cordials which are helping my current non-alcoholic ways- such as this lime, lemongrass and ginger cordial. A few weeks ago I bought one of those dine in for £10 deals from M&S. Because I’m not drinking I had the lime and lemongrass presse. It was very good, but it could make quite a dent on my wallet if I bought it on a regular basis. So I decided to give something similar a go at home. 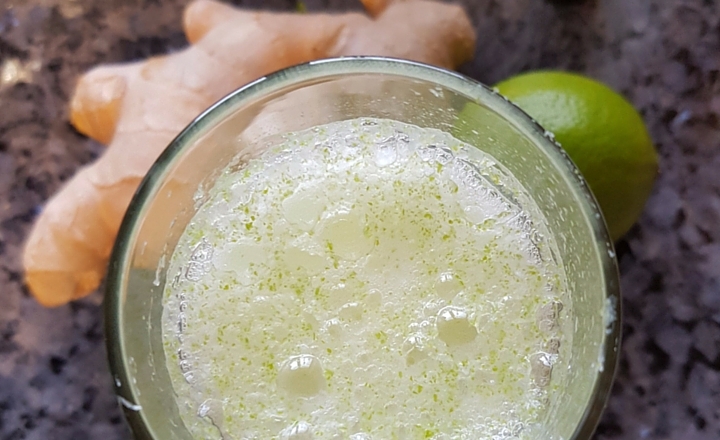 It would be easy to make more of this at once- just multiply the ingredients and maybe add less water as your mixer gets full. The supermarket limes here are a bit small at the moment. If you live near a good market or in warmer climes than Manchester then snap up a bag full and get juicing. 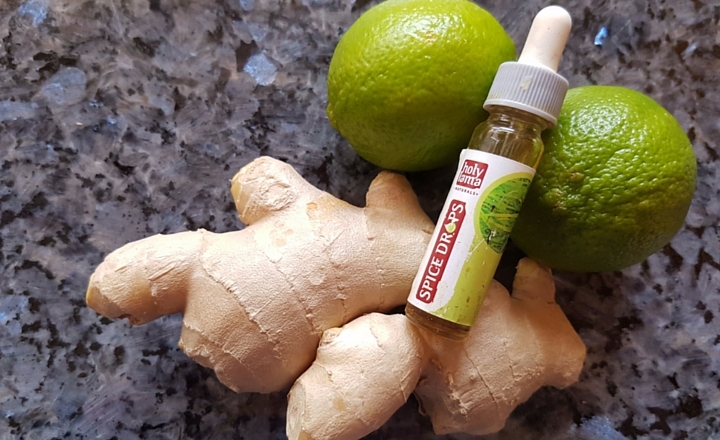 Lemongrass Spice Drops are great because there are no woody bits, but if you can’t wait to get a bottle online, mince your lemongrass very finely with a grater before adding it to the mixer. I only use a bit of sugar as I like it tart – you can add more to taste. As I want to keep it quite healthy I will be experimenting with adding leaves from my new stevia plant when it is a bit bigger. I think this would also be great frozen in ice cube trays if you are making lots and plopped out into glasses of water or even in a G&T or white wine and soda in the summer. It really is very refreshing. One quantity made enough for four large glasses for me. A healthy, refreshing cordial made in the Nutri Ninja. Perfect for summer! Place all of the ingredients in your blender cup and blitz for 1 minute. I use the ultra blend setting on my Nutri Ninja- just make sure there are no big pieces left in it. This is quite a tart mix. If you want it sweeter add more sugar. Pour into a clean jar or jug and store in the fridge. To use, add to a glass as you would cordial. Top up with ice and soda water, or maybe lemonade if you would like it a bit sweeter. 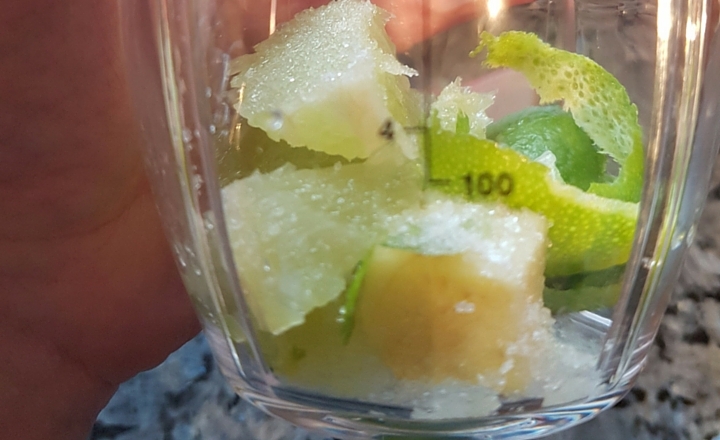 Easy to scale up - just add less water the more limes you put in. Try using a mix of limes and lemons for something a bit different. Keeps in the fridge for at least a couple of days or freeze in to ice cube trays and add to water or cocktails for a tangy hit!